In 1987, Michael Worthington Williams told the story of the Bentall car and looked at the last survivor, a 1908 16/20. TODAY, the whole concept of a successful family car being built by a firm primarily known for, and engaged in, the manufacture of agricultural implements, would be an anathema to the PR pundits of Madison Avenue and Brook Street, Mayfair. Such was not always the case. In America, particularly, the farmer who farmed with equipment from International Harvester very probably drove an IHC 'Highwheeler' to church on Sundays, and in the twenties the Case car was as respected as the Case tractor. To a lesser extent, the same was true in Britain, the most notable example being Wolseley, which grew from a company making sheep shearing machinery, the successors of which survive to this day. Neither was it at all illogical, bearing in mind that the farming industry was early to mechanise, and certainly one of the first to accept self propelled machines as a means of increasing both production and efficiency. Traction engines, for ploughing, threshing and other duties, were an everyday sight on country roads before 1896, and their presence there was largely responsible for the use of the word 'locomotive' in the emancipating Locomotives on Highways Act of 1896. The Bentall family had been farming for generations before that date, however, in and around the quiet Essex backwater of Goldhanger near the estuary of the Blackwater River. It was heavy soil (and still is) but William Bentall was an inventive yeoman farmer and a devotee of Coke of Norfolk, the 'Father of English Farming', then holding his shows at Holkham. Bentall devised and built a new type of plough in a small foundry and smithy opposite his farmhouse, sometime between 1760 and 1790. It is still known as Foundry Field to this day. The Goldhanger plough proved so successful that it was placed on the market in 1797, and from those small beginnings grew a factory at Heybridge from which, in due course, emanated the first steam driven threshers, drills, horse rakes, rolls, crushers and divers other agricultural inventions. He patented none of them, but nevertheless contrived to grow rich. His son Edward Hammond Bentall was born in 1814, and under his eventual guidance the company prospered still further. In 1889, Edward relinquished control of the company to his son, Edmund Ernest Bentall, who had also inherited the family talent for invention along with the thriving family business. As early as 1900 he designed and had built a petrol engine specifically intended to power a wide range of agricultural machinery. It proved thrifty in operation always a good selling point with farmers and, perhaps more importantly, standardised its component parts so that any repairs necessary could be carried out by the farmer himself with spares supplied by the company. Such standardisation was by no means universal in the motor industry, even after 1908, in which year three production Cadillac cars were dismantled at Brooklands, their components totally mixed up, reassembled, and the cars then run on the track. The RAC awarded Cadillac the Dewar Trophy for this achievement, but were presumably unaware of Bentall's activities eight years previously. E.E. Bentall was, in fact, an enthusiastic motorist and as early as 1900 he purchased a twin cylinder Georges Richard car to become the first motorist in the Maldon area. He replaced this after two years with a four cylinder Richard Brasier, engaging as his chauffeur a young man articled to the company named Ernie Linnett. He was later destined to become the chief engineer of the Bentall car department. But we are anticipating history, and in 1903 Mr. Bentall graduated to a secondhand seven seater Daimler which proved unsatisfactory. It was replaced by a six cylinder Singer, although this presents a degree of mystery since Singer exhibited only one experimental six cylinder engine in 1906 and none are known to have reached the public. 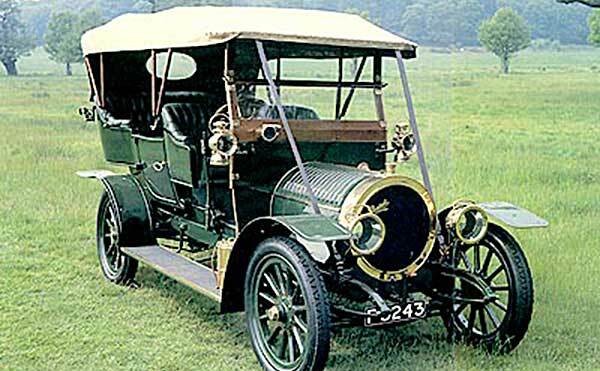 In 1904, however, Bentall made two 8hp prototype cars in its own works. Although these employed a proprietary Crypto chassis bought in complete with engine bearers, steering assembly, axles and gearbox, they appear to have been quite satisfactory in operation. They were never sold, however, and remained as hacks within the Bentall family for some years. In 1905, however, the decision was taken to tool up seriously for the manufacture of motorcars. The company ran its own foundry already, and was therefore in a strong position to manufacture the majority of its components 'in house'. The first six production models were similar to the prototypes using Crypto chassis frames and Lemoine axles, but thereafter a chassis of Bentall design and construction was employed. This was of simple rectangular construction, with sidemembers deeper in the centre and narrowing at each end, and the cross members were bolted rather than rivetted on. An 'oversquare' engine configuration was chosen, which placed the Bentall at something of a disadvantage once the horsepower tax was introduced. The later four cylinder 16/20 Bentall model, for example, with its 100min bore, was taxed at 24.8hp. Three engine sizes were initially available, the 8hp and 11 hp both being water cooled twins. The smaller of these employed a 100mm by 95mm bore and stroke, and two of these were exhibited at the 1906 Olympia Show on Stand 123, alongside a 16hp bare chassis. The 8hp models carried a detachable Brougham top and a gig body with hood respectively, whilst the bare chassis drew attention to the patented propeller shaft which eschewed universal joints. Various ignition systems were tried during the relatively short period of production up to 1913, and these included, initially, a low tension Bosch magneto, which was later replaced by the Bentall Simplex, and finally a high tension type. Simms magneto and Delco dual ignition systems were also fitted on some cars. The fuel tank was located under the front seat, feeding by gravity to the carburettor which, at various times in the life of the marque, would have been a Longuemare, Grouvel & Arquembourg, or a Claudel Hobson. In its final form, however, the Bentall boasted a carburettor of own manufacture which incorporated an automatic mechanical choking system. Operated by a lever on the steering column, this strengthened or weakened the air regulating spring as required. The distinctive round radiator, echoing that of illustrious contemporaries like the Delaunay Belleville, was actually made in France by Molineaux, and cooling was aided by an efficient centrifugal pump which was driven by a spur wheel from the crankshaft. The best Sheffield steel was employed for the springs which were semi elliptic at the front and fully elliptic at the rear. The cars were not cheap, an 11hp two seater costing £220, and £420 providing a 16/20 Landaulette. The firm did not maintain its own bodyshops, bodies being built in the main by Thorns of Islington, Mannions of Chelmsford and Adams of Colchester, but customers could specify any coachbuilder of their own choice. Marketing was very low key indeed with very little expenditure on advertising and only one local agent Glovers of Witham, Essex being appointed. Glovers ran a whole fleet of Bentalls themselves, but London sales were handled by the Acre Autocar Co. of 117 Long Acre. Bentall did invite enquiries from agents, but seemed content to sell most of its cars by recommendation, most of them to local Essex farmers, although a handful (like much of Bentall's agricultural machinery) did find their way abroad. 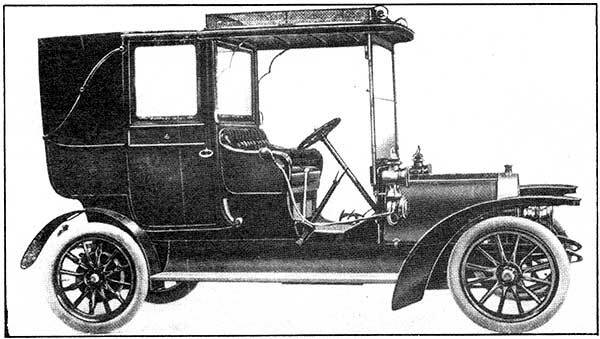 The 11hp chassis was also offered as a van or commercial traveller's brougham. 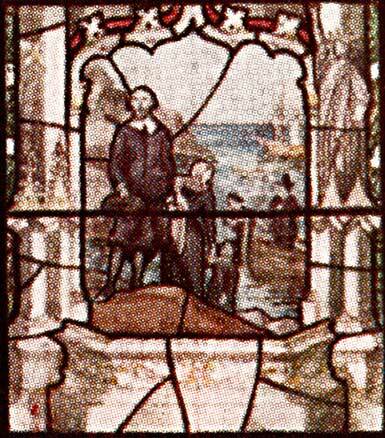 One of the first local worthies to own a Bentall was the great motoring parson Reverend Eyre, Rector of Great Totham, who sent his sixteen year old groom to the works to be taught to drive. Other notables included the Rt.Hon.Sir Fortescue Flahery, the MP for Maldon. He purchased one of the last Bentalls built, a 1912 16/20 cabriolet finished in dark green and black striped livery. Motoring competition did not feature largely in the firm's list of priorities, and the Bentall's sole recorded essay into this field was in the 1908 Scottish Reliability Trials. The works entry finished seventh in a field of eleven vehicles. From time to time the company experimented with other types of engine, and at the 1908 Motor Show a Knight sleeve valve engine of the type later popularised by Daimler was shown in a 16/20 chassis, but never put into production. Similarly two years later a silent piston valve engine, built under C. Bingharm's patent, appeared on the Olympia stand. A peculiarity of this design was that the valves apparently moved far more slowly than the pistons. With an engine speed of 2000rpm, therefore, the valve shafts would be rotating at only 500 rpm. Here again, however, no production resulted. Just one proprietary engined Bentall was built a Landaulette, mounted on a longer than standard wheelbase chassis and using a four cylinder long stroke Aster engine. Production of Bentall cars ceased in 1912 (some lists say 1913) after about 100 cars had been built. It was not a financial success, and the £60,000 which had been invested in tooling and production processes was probably never recouped. The bi bloc engines were becoming outdated by 1910, however, and the taxation system favoured long stroke engines of small bore. A consious decision was therefore taken to concentrate on stationary engines and farm implements, and this the company did successfully until relatively recently. It eventually became part of a group which included Coles Cranes and Acrow jacks, and it was the collapse of the whole group which brought the eventual liquidation in the 1980s. Of the 100 cars built and sold, there is at present one known surviving car, a 1908 four/five seater open touring 16/20 which appears to have been retained by the works for some months before being registered on April 28, 1909. It may well be, however, that the unregistered chassis was dispatched to the coachbuilders and not completed until some time before to April 1909, not an uncommon occurrence. Fortunately the Essex records have survived, and from them we know that the car passed through the hands of two further owners. Its history thereafter becomes more difficult to trace, but a solitary photograph does survive taken shortly after the Great War, and illustrating the car nearing the end of its working life. It had been acquired by a cycle repairer, named J.W. Fish, and very soon after the photo was taken the half of the body was removed to make a light truck. By the 1950s, the car was derelict and very little more than a chassis when it was rediscovered by its makers and rebuilt by them. 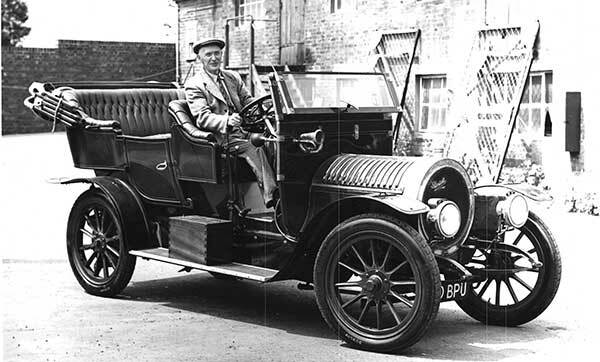 The work was supervised by Ernie Linnett (pictured above with the finished first restoration), still with the company, and a four/five seater open tourer body was commissioned from Munnions of Chelmsford, also still in business. It was the last car coachwork job the old company was to complete, but there was nothing wrong with the quality of workmanship. Upholstery, however, like much undertaken during that period of low car values, was in vinyl, and by the time of Bentall's eventual liquidation, that fifties rebuild was beginning to look very much like an older restoration. The car was purchased by Bentalls plc of Kingston upon Thames, the well-known department store (no relation to the makers) and the task of completely refurbishing it throughout was entrusted to Richard Peskett of Hindhead. Richard is a well known figure in the commercial vehicle field with a first class record of vehicle restoration behind him. The Bentall spent some months in his workshops at The Sawmills, Stedham, near Midhurst in West Sussex, and you see the result here. During that first restoration some thirty years ago, no one bothered to reclaim the original registration F3243, and a modern number was allocated to the car. We're pleased to say, however, that the DVLC have agreed to restore the original number to the car on historical grounds, so the restoration is complete in every detail including correct leather upholstery. Richard had to confess that the Bentall's performance in top gear is a little disappointing. Having spoken to the son of a family who owned three in the 'teens and twenties, however, it appears that, although they were always good hill climbers, in top gear the "slightest sniff of a hill, and it was all over". But remember, the Bentall was built on the edge of East Anglia, hardly renowned for its hills, and intended mainly for a local market. And has been reproduced with their kind permission. Colour pictures by Ken Mapes.